Korenix JetNet 7020G is a layer 3 routing switch that has high port numbers with 16 ports Gigabit Ethernet RJ-45 and 4 ports Gigabit with RJ-45 or SFP combo design. The high port number allows you to customize your switch to meet the specific needs of your network, no matter which industry you’re in. In addition, Korenix JetNet 7020G is designed in compact size and provides 40Gbps Non-Blocking, High Speed Network. Moreover, Jetnet 7020G supports a wide range of security features, including IP Source Guard, Deny of ARP Inspection and TACACS+, etc. The advanced network security provides an easy and fast route for engineers to build a robust, secure solution. JetNet 7020G also supports multiple network redundancy. 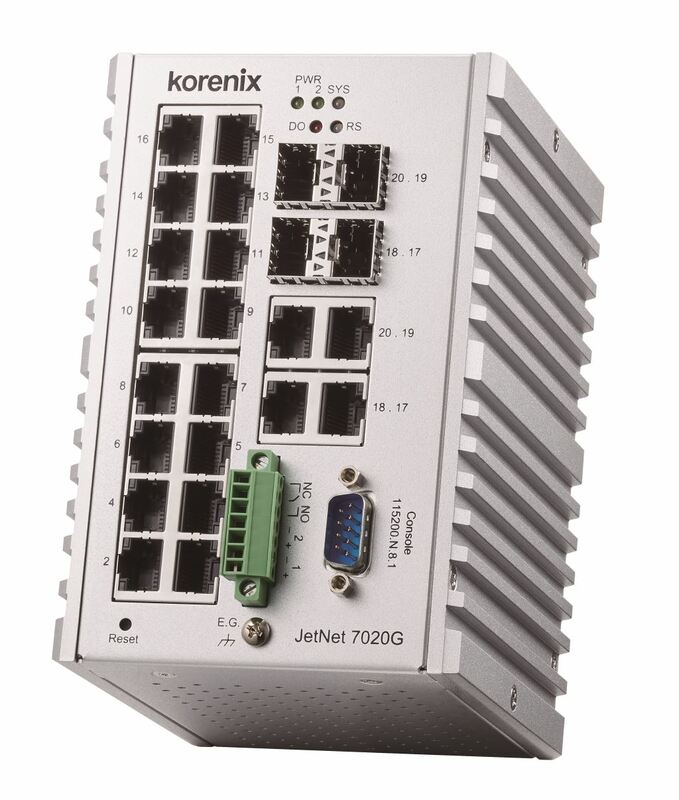 Like all other Korenix products, JetNet 7020G is equipped with industrial outer design. With -40~75°C operating temperature, 10-60V DC wide power input and serious electromagnetic interfere. Thus, the robust design can be applied in harsh environments such as, railway communication, traffic signaling system and power substation for smart grid applications. With the slim and robust outer design, high port numbers and advanced security, Korenix Industrial Gigabit Ethernet L3 switch is a strong and high-performance device that can be applied in various vertical fields. Why Korenix JetNet 7020G Industrial Gigabit Ethernet L3 Switch?